Letter from Congress urging the DOJ to disseminate torture report. National Security Archive FOIA Project Director Nate Jones called on the Archivist of the United States, David Ferriero, to use his binding legal authority to declare the Senate Intelligence Committee’s report on the CIA torture program a federal record. Jones made the call at the most recent FOIA Advisory Committee meeting, and noted that the Presidential and Federal Records Act Amendments of 2014 gives the Archivist of the United States the authority to determine whether or not something constitutes a federal record. The New York Times reported in November 2015 that the Department of Justice refused to allow its own officials, as well as those of the Defense Department, the CIA, and the State Department, to read the report under the pretense that its status as congressional or executive branch record is unclear. 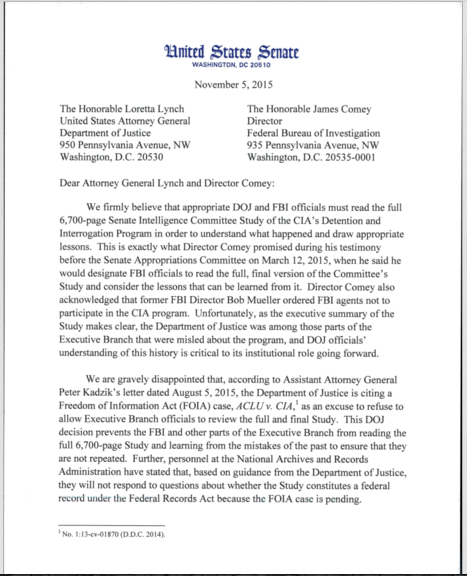 A letter from Sen. Dianne Feinstein (D-Calif.) and Sen. Patrick Leahy (D-Vt.) noted that “personnel at the National Archives and Records Administration have stated that, based on guidance from the Department of Justice, they will not respond to questions about whether the Study constitutes a federal record under the Federal Records Act because the FOIA case is pending.” Jones stated that the Federal FOIA Advisory Council, the Department of Justice, and US National Archives must act “with deeds not just words” to support FOIA. To do this, the entities involved should call the Torture Report what it is: a federal record, and allow it to be reviewed on its merits via FOIA, even if it is found that it must be currently withheld under Exemption One to protect US national security. Claiming it is “not a record” so that it exists in a land beyond FOIA because of fear that it may be released is not a solution appropriate for the Federal FOIA Advisory Board, or its members, to make or endorse. Other news from the FOIA Advisory Committee meeting includes the announcement that its mandate has been extended for an additional two years. The Committee also voted to move forward on ultimately requesting that Archivist David Ferriero request that the Office of Management and Budget (OMB) update its FOIA fee guidelines. The “current” guidance is missing a key word pertaining to what amount of FOIA costs agencies are intended to recoup through fees, and dates from 1987 – well before the internet and agencies’ ability to cut copying costs by sending records electronically. Future Committee meetings will also be live streamed; video recording of the most recent meetings were delayed by over a month because of 508 compliance issues – which require that federal agencies ensure that persons with disabilities have comparable access to data as persons without disabilities, including video transcripts. 64% of respondents fell into the Educational/Non-Commercial/ Scientific Institute/News Media fee category; 9% didn’t know their fee category. If you are unsure of your fee category, check out the Archive’s helpful guide here and page 12 here. 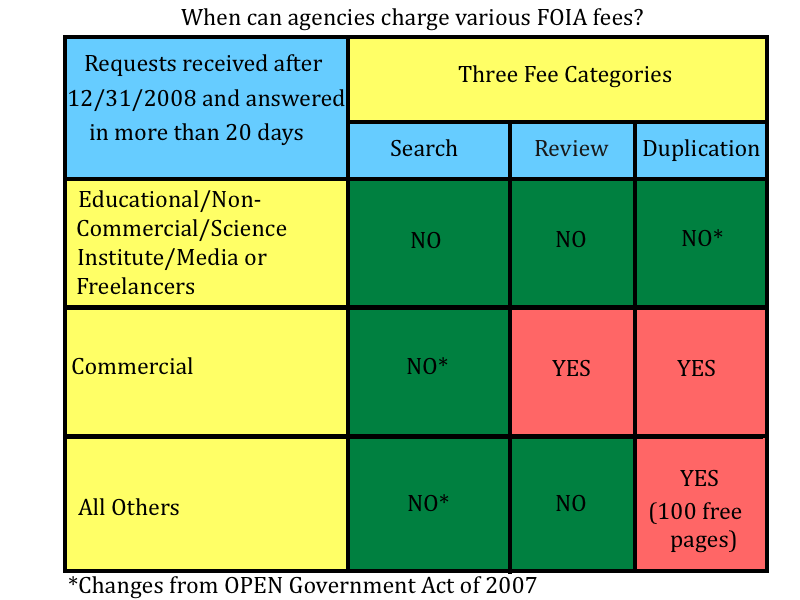 Most respondents, 65%, were unaware that under the Open Government Act of 2007 that agencies are not allowed to charge non-commercial FOIA requesters “search fees, or, if applicable, duplication fees” if the agency misses the FOIA’s statutory twenty-day response deadline. Nearly a quarter or respondents spent 1-3 hours addressing fee-related issues per request. 70% of respondents saw an advantage to eliminating FOIA fees, 30% saw a disadvantage. Most who saw a disadvantage to eliminating fees cited concerns that requesters would abuse the system. The National Security Archive joined more than 40 other open government groups, in an effort coordinated by Openthegovernment.org, criticizing the troubling carve-outs for the Intelligence Community in the House’s otherwise very good FOIA reform bill. The bill contains exemptions for the 17 agencies that make up the Intelligence Community from certain provisions of the bill, including “language that states that currently-protected information relating to ‘sources and methods’ would not be subject to disclosure under any of the amendments in the bill”. The bill also exempts the IC from necessary reforms to the consultation process and a provision requiring agencies to publish “a list” of all denied material unless the disclosure is prohibited by law. The 17 IC agencies are among the most frequently FOIA-ed in the government; they are: The Department of Homeland Security; the Department of State; Air Force Intelligence; Army Intelligence; the Central Intelligence Agency; Coast Guard Intelligence; the Defense Intelligence Agency; the Department of Energy; the Department of the Treasury; the Drug Enforcement Administration; the Federal Bureau of Investigation; Marine Corps Intelligence; the National Geospatial-Intelligence Agency; the National Reconnaissance Office; the National Security Agency; Navy Intelligence; and the Office of the Director of National Intelligence. The carve-outs would create an unacceptable two-track FOIA system and undermine the otherwise very good FOIA improvements in the bill, including its codification of a presumption of openness, strengthening of the FOIA ombuds OGIS, and placing a 25-year-sunset for FOIA’s “withhold it because you want to” Exemption 5. Image from “U. 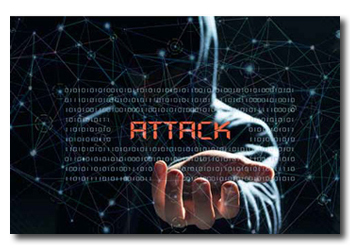 S. Fleet Cyber Command / TENTH Fleet, Strategic Plan 2015 – 2020” brochure. The latest posting for the Archive’s Cyber Vault Project – an online resource documenting the cyber activities of the US and foreign governments – sheds light on various aspects of US military operations in cyberspace. The posting consists of 27 records, obtained largely through the FOIA, and covers six key areas, including terminology and computer network defense. Highlights from the documents include a declassified Secret May 19, 2011, Cyber Command operations order on the role of Cyber Command and other military cyber organizations in Operation Gladiator Shield – defense of the Global Information Grid, and the Department of Defense’s August 28, 2009, Strategy for Counterintelligence in Cyberspace, which notes that “a new operational environment has emerged as evidenced by the increasing frequency and destructiveness of attacks and exploits launched against the United States through cyberspace.” Visit the Cyber Vault for previous postings on the National Security Agency and Cyberspace and US national security. The Naval Criminal Investigative Service is reopening its investigation into the beatings – one that resulted in death – of several detainees in Afghanistan at the hands of Navy SEALs and Afghan security forces. US Army soldiers told NCIS they witnessed the abuse, and “A Navy lawyer advising the command recommended in 2012 that three members of the SEALs be charged with assault. But a SEAL commander cleared the team members of any wrongdoing in a closed disciplinary process typically used only for minor infractions.” NCIS reopened its case after questions from Congress in the wake of the Times initial reporting on this incident last month. An enthusiastic redactor-motorist, or something else? 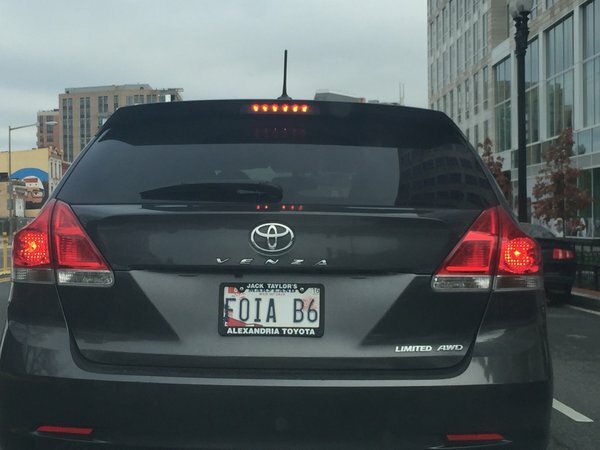 Naomi Gilens recently shared a picture on twitter of a Maryland driver ostensibly promoting FOIA’s Exemption 6 – the personal privacy exemption. Reflecting the District’s love of FOIA, the plate has received a lot of attention, liked 42 times and re-tweeted 19. Today’s #tbt pick is chosen with the recent 35th anniversary of the ending of the Iranian hostage crisis in mind. It is a 1980 Farsi “survival guide” of phrases that was issued to the Delta Force commandos who participated in the failed Desert One rescue mission in April 1980. The Top Secret document was release to the Archive after a 12-year fight and a FOIA lawsuit. Top Secret 1980 survival guide released thanks to a FOIA lawsuit.